Akane Hiyama is one of the protagonists of the series. She is a high school student of the same class of Seiji Aino, and she is madly in love with him. Akane is the school's idol who Seiji is in love with, but her personality turns out to be a little more than he bargained for. 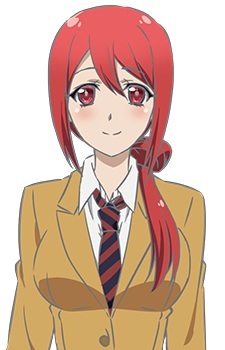 Although they have different surnames, she's also the older sister of Yuzu Kichougasaki. Akane is absolutely without a doubt a pure genuine Yandere, although she seemed like an innocent girl when she first was shown in the series. She is not afraid to attack those whom seek a relationship towards Seiji, and would most likely kill them if needed. It is proven that she would kill people in episode one, when she kept stabbing Seiji but he couldn't die because Guri said that they were short-termed angels. She also is willing to kill herself when Seiji died in episode five.